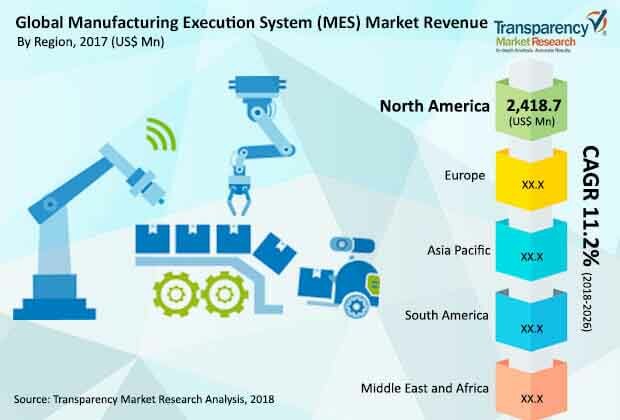 According to a new market report published by Transparency Market Research The global manufacturing execution system (MES) market is expected to reach a value of US$ 18,067.9 Mn by 2025 on account of the rising demand for improving productivity and executing complex production processes efficiently. The market is projected to expand at a CAGR of 11.2% during the forecast period from 2017 to 2025. The growth is attributed to growing investments in manufacturing sector and advancements in industrial automation. Asia Pacific is anticipated to be the fastest growing region which is expected to be followed by Middle East & Africa during the forecast period. Whereas, the food and beverages segment is expected to be the fastest growing, owing to the requirement of maintaining product quality standards in the food and beverage industry. Further, demand for MES solutions is expected to surge in coming years due to rise in demand for paperless operations from manufacturing industries in developing countries such as China, India and Brazil. Compliance with stringent government regulations and demand for industrial automation is driving the global manufacturing execution system market. Highly regulated industries such as medical device and equipment manufacturers require intensive internal and external reporting to comply with strict government regulations. Quality and uniformity is given the maximum importance in such highly regulated industries. In most developed countries, organizations in the bio-tech, pharmaceutical, food processing/packaging and medical devices sectors face tight regulations and stringent compliance standards. Furthermore, manufacturing industries are experiencing increasing overhead and material costs. In addition, competitive economic conditions are compelling manufacturers to increase production in a cost effective manner. This in turn is leading to growing demand for implementation of industrial control systems aimed at optimizing processes and providing better visibility of the shop floor. Manufacturing execution system market is segmented on the basis of process industry, discrete industry and components. According to the research study, the global manufacturing execution system market by process industry was dominated by the oil & gas segment with a significant market share in 2016, owning to the factors such as rising demand for automation in oil and gas industries for improving production efficiency. The primary function of MES in the oil and gas sector includes applications to manage short term scheduling of operations and long term planning. Whereas, the food and beverages segment is expected to be the fastest growing segment, owing to the requirement of maintaining product quality standards in the food and beverage industry. Moreover, capability of MES to comply with government regulations and for standardization of manufacturing operations is boosting the growth of the food and beverages segment. In terms of discrete industries, automotive industry is found to be the largest market segment in 2016, and is expected to continue its dominance over the forecast period. Increase in vehicle production globally is driving the growth of the automotive industry. Fulfilling the market demand and faster time to market along with shortened product life cycle is driving the installation of MES in the automotive industry. The sector is also at the forefront of innovation, in order to respond to the opportunities and competition. FMCG segment is also expected to witness high growth during the forecast period. In 2016, under components, software segment was the largest market in the overall manufacturing execution system market in terms of revenue. Software segment is also anticipated to continue its dominance over the forecast period. This is due to rising deployment of MES in a hybrid cloud, which is expected to observe significant increase in its market share. Increasing demand for hybrid deployment can be attributed to reduced integration and service cost. North America led the global manufacturing execution system market with a substantial market share in 2016. Among all industries, the oil and gas segment in North America accounted for maximum revenue share in the market. This is because of the continuous improvements in the operation environment, with cutting-edge scheduling and tracking mechanisms meant to drive the operational efficiency. The rising manufacturing activities in Mexico are anticipated to result in increased demand for MES solutions in the country. On account of new opportunities, APAC and Middle East & Africa MES regions are expected to grow at a higher rate during the forecast period. Key factors driving adoption of MES solutions in the APAC region includes growing GDP, favourable government policies, rapid industrialization, shifting of production bases to low cost Asian countries. China dominated the market share in 2015 and is expected to continue its dominance over the forecast period from 2017 to 2025. The promising growth prospects of the Asia Pacific manufacturing execution system market can be attributed to the rising demand for MES in the chemical and automotive industry. The research study includes profiles of leading companies operating in the global manufacturing execution system market. Some of the key players profiled in the MES market include ABB Ltd., Honeywell International Inc., General Electric Company, Schneider Electric S.E., Dassault Systems SA, Emerson Electric Co., General Electric Co., IQMS, SAP SE, HCL Technologies Limited, Yokogawa Electric Corporation, Atos SE, Prolink Solutions, Sage Automation, OpMetrik and Siemens AG among others.